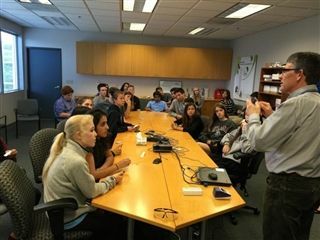 On Friday, April 24th, a group of chemistry students traveled with Mr. Emmerson to the San Diego office of Becton, Dickinson and Company, a global medical technology company. Students heard a presentation on immunology and the chemistry of gold atoms, and received an overview of the company's research, development and manufacturing. After a short tour of the chemistry facilities and equipment, students got a chance to work with one of the company's products, running a quick test to detect the presence of the influenza virus.